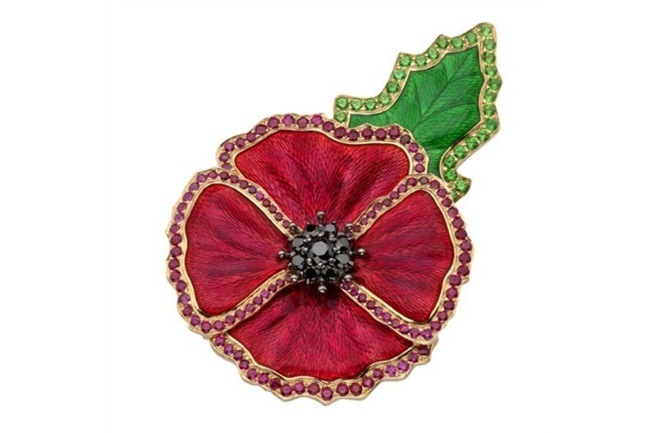 British royal jewelers Garrard have commissioned a stunning, one-off poppy-shaped brooch, valued at a well, eye-popping £25,000. The bejeweled symbol of patriotism will go under the hammer at the annual Poppy Ball, with proceeds going to The Royal British Legion. The immediately recognizable badge of the UK’s Remembrance Day has been reimagined by Garrard into a dazzling, intricately layered high jewelry piece, hand-painted and crafted by Garrard’s artisans in their London manufacture. Set with black diamonds, rubies and tsavorite garnets in 18ct gold, the 42mm by 64mm brooch’s petals and leaves are emblazoned with red and green translucent enamel. The reverse side is engraved with the simple inscription: “The Royal British Legion Poppy Ball 2011”. Update: The Daily Mail has reported that the Garrard brooch was stolen hours before it was due to be worn by classical singer Katherine Jenkins in a performance at the British Legion Festival of Remembrance at Royal Albert Hall. The brooch was reportedly filched from the handbag of a Legion employee. Watch this space for the latest update on the unfolding saga.